Nationwide the increase in sales for primary residences is rising at an incredible rate. 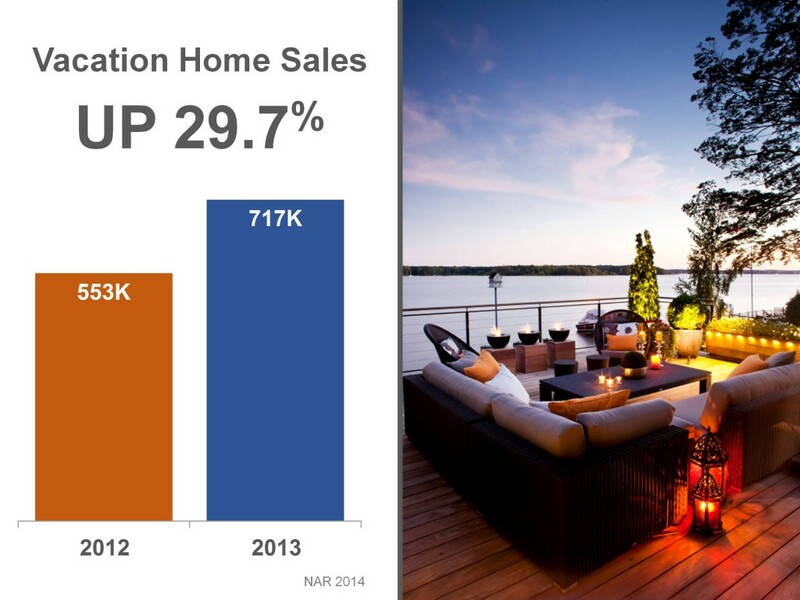 Even more so, the second home sales rates are also trending positively. Homeowners have been wary for several years, and with good reason, for not selling. Their investments years prior would not recoup on their equity, or a tough market would not allow for an efficient sale. If there was no immediate need to sell, then there was no reason. But now, the vacation home market is ready and buyers are waiting anxiously for more inventory. The National Association of Realtors compiled the numbers above to display a 29.7 percent increase in vacation home sales from 2012 to 2013. All sources continue to point positively towards pricing that favors current homeowners and interest rates still on the lower side for buyers. All in all, if you are on the fence about selling your home, this spring and summer are a fantastic time to enter the market. We are here for further advice or information if need be, don’t hesitate to contact us for further advice or information. Haven’t sold a home in a few years? Our Definitive Guide to Selling Your Home will help to brush up on the basics.